Spring is finally here and with the warmer weather and longer days comes hatching season. With that being said, have you reserved your Heritage Turkey for Thanksgiving? It may seem a little premature to be thinking about Thanksgiving dinner in March, but in reality, all those Heritage Turkey producers are preparing NOW for Thanksgiving. This past year I answered a number of media calls about Heritage Turkeys. These birds are all the craze around November, but what about every other day of the year? I think sometimes people forget all the effort that goes into raising these birds. For most consumers, a Heritage Turkey is a one-day event, but for the producers of these birds Heritage Turkeys are a year-round committment. I'm not sure the average consumer understands what goes into raising these birds, and to be honest, I'm not sure I have a complete and wholistic perspective of what it takes to save these breeds. The blood, the sweat, the tears.....they are often forgotten. Last year after coming to this realization that there is an untold story behind the Heritage Turkey, I decided that 2010 would be the year of the Heritage Turkey Project. It needs a catchier name, but essentially I've already reserved my Thanksgiving turkey for this year and I plan to track my turkey through the process from conception to consumption. I want to share the farmer's story, the bird's story, the breed's story, and all the side stories that result from raising these breeds. I've reserved my bird from Border Springs Farm in Virginia. The farmer, Craig Rogers, has agreed to help me tell this story by providing regular updates, images, and dialogue as we go through the process of hatching, growing out, and finally eating this bird. I'm excited about this venture and I hope it will help capture the conservation process. Heritage Turkey conservation doesn't happen on Thanksgiving day alone - it happens every other day of the year - and we need to remember that! I asked Craig to paint a picture of his farm for me and for others interested in this project. Enjoy! 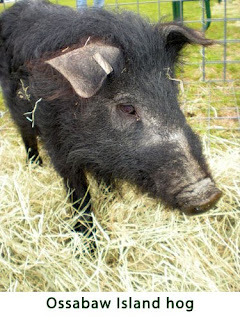 Border Springs Farm is nestled in the foothills of the Blue Ridge area in Virginia, just a stone’s throw away from the North Carolina border. Our nearest Tractor Supply, movie theater, and McDonald’s is in Mt. Airy, NC, better known as Mayberry on the Andy Griffith Show. We can see Pilot Mountain (Mt. Pilot on the TV show) from our farm. Everything on our farm has an aesthetic purpose. Our sheep are our primary farm business but they came to us as a result of our love and admiration for working Border Collies. For Joan and I, nothing is more serene and beautiful than a flock of sheep grazing on the green pastures on the foothills of the Blue Ridge. 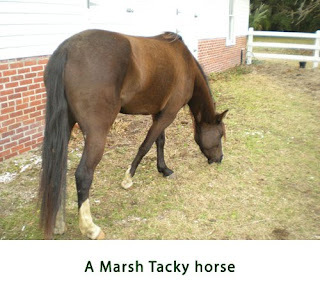 We have a donkey, Marshall, who was supposed to guard the sheep but instead fell in love with Tuff and Maverick; a Quarter Horse and a Tennessee Walker. 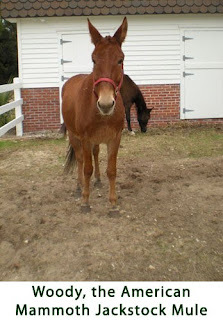 Really, Tuff and Maverick are nothing more than pasture ornaments as well. We have several livestock guardian dogs living with the sheep, or chasing buzzards, or “greeting” new guests who add color and an evening serenade known as the “Shepherd’s Lullaby”. There have been the occasional chickens to provide eggs for the dogs diet and an even less frequent omelet. But the latest addition that just tickles me endlessly, are my Heritage Turkeys. Last year, as a result of my fascination and disdain with the claims of “sustainable” farmers who buy livestock through the US Mail, I decided to try a new “hobby” to test the challenges of truly sustainable poultry rearing. As a sheep dog handler who has traveled the country competing with my dogs, on both sheep and cattle, I have always found turkeys on a farm hosting a dog trial to be so incredibly cool. I love the way they strut around, I enjoy the show of colors, and I get a kick out of their chatter. Fortunately, there is a breeder of game birds and poultry just across town and his father raises heritage turkeys. So to get started last year, I bought an assortment of day old poults; Bronze, Bourbon Red, Royal Palm, and Slate; and it appeared some “mistakes” shall we say. I had a great time raising these birds, first in my basement and then in the barn before they were released to enjoy the entire 60 acre farm. It was nothing short of an amazing learning experience. Fortunately, we had no major problems. The turkeys did very well. They enjoyed the trees surrounding the barn, a couple of pesky Toms terrorized the livestock guardian dogs much to the dismay of my wife, the roamed every inch of our farm but always found their way back to the barn 30 minutes before sun down. They added so much fun to farm tours. When children would come to the farm, we would search out the turkeys. When one of the children would “gobble” all of the turkeys would answer back. It made children and adults laugh and it was not long before Mom, Dad, Granddad and Grandma were gobbling and chatting with the turkeys. About the only thing I knew about turkeys, I had learned with all of my other livestock ventures, that if you want to have the best livestock you must search out the best foundation breeding stock. So off to Lindsborg, Kansas I was bound to see Mr. Frank Reese – the Godfather of Heritage Turkeys. More to come on the breeds and the foundation stock in the next edition of the Heritage Turkey Project. This past week, Jeannette and I spent several days in the Lowcountry of South Carolina doing field work, outreach, education, marketing, and promotion. It was a busy trip with lots of interesting side stories that we will share here over the next few weeks. 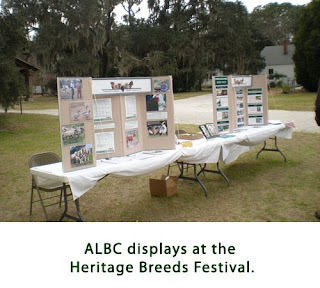 On Saturday, ALBC participated in the first annual Lowcountry Heritage Breeds Festival held at the Coastal Discovery Museum in Hilton Head, SC. The event was a success! There were over 1,200 people that attended and everyone was engaged and eager to learn more about heritage breeds. We tested out our new display which features then and now images of endangered breeds. It's great to see photos from a 100 years ago next to pictures from today - and these breeds look the same! They really are the breeds of our ancestors. Jeannette also did two presentations at the event. These were both very well received. There was standing room only and probably 70+ participants at each one. It's exciting to see people wanting to learn more about these breeds, how they shaped agriculture, and how we can help save them. 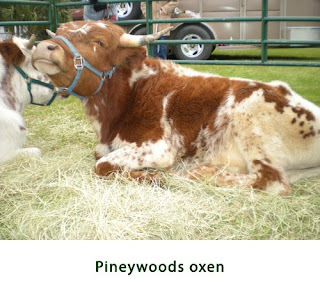 We are still catching up from the trip, but I wanted to post a few images from the Heritage Breeds Festival. More images to come from the 2nd Annual Marsh Tacky Races!